A carpet can both keep your feet warm and add a great touch to any room. However, if you have small children or you like to entertain, your carpet will probably take a beating. What’s more, if you live in a rainy city like Jacksonville, you’re likely to track in mud often. But don’t worry – there are ways to remove almost all carpet stains. However, depending on the type of stain and the amount of time that has transpired, it may be too difficult to remove on your own. In that case you’ll need to hire a professional carpet cleaning service. The first rule when dealing with carpet stains is to blot. Don’t wipe or rub the stain as this will cause it to spread and/or set into the material. Additionally, always use a white paper towel or cotton cloth since paper towels with patterns or pictures can leave behind their own stains. To remove a coffee stains mix a teaspoon of dish detergent with a quart of warm water. Apply the mixture a little at a time. Work it in a bit with your fingers, and then blot it up with a white cloth. Next, mix three ounces of plain white vinegar with six ounces of water and apply it to the stained area several times. Blot up the excess moisture each time. Rinse the area with tap water and blot it up. 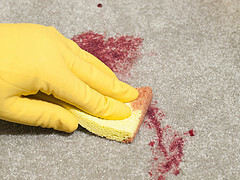 Stains left by juice and red wine can be removed by applying the above vinegar solution of three ounces of white vinegar and six ounces of water. This is best applied using a spray bottle. Blot it up and repeat the process as long as you still see stains on your cloth. Once this stops mix five drops of dish soap with warm water and spray it onto the spot. Blot it up with a clean cloth and repeat. Use tap water to rinse out any remaining stain and blot to dry. To remove a wax stain, place an ice cube on the spot. The wax should harden and be easily broken up so you can remove it. For the remainder, place a clean brown paper bag over the wax and place an iron on it, set to low. The wax will liquefy and transfer to the paper. Apply a new paper bag as necessary until you get out all the wax. When removing blood it’s important to use only cold water because warm water will cause the blood to set. Add a little bit of water, blot it up with a clean cloth, and repeat. If this doesn’t remove all of it, add a few drops of dish soap to the water. Blot up the excess water when you are done. To remove chewing gum heat up the area with a hair dryer, being careful not to melt the carpet fibers. Place a piece of plastic wrap onto the softened gum and lift it away. If some gum still remains, apply a muscle rub containing methyl-salicylate. Use plastic again to pull up more gum. After you remove the gum clean the area with a few drops of dish soap mixed with a cup of warm water. Some substances, like bleach, for example, are extremely hard to remove and homemade remedies won’t be enough. When that happens be sure to contact a professional carpet cleaner. You don’t want to have to contact a carpet installer because you ruined your carpet by applying untried mixtures or being too forceful. Glossy New Kitchen Floor Tile … At Last!